The traditional dog meat festival to be held on Wednesday in Yulin, South China's Guangxi Zhuang Autonomous Region is taking place in a much more subdued manner this year due to pressure from animal rights activists and the fact that the local government is keeping a distance from the increasingly controversial event. Many restaurants have now covered the Chinese character "dog" on their signboards or simply changed the name in order not to offend dog rights activists who can resort to violent means to stop the centuries-old local tradition. Dog meat can still be found in Yulin markets but dogs are being slaughtered outside the city in preparation for the city's annual dog meat festival, a sharp contrast to previous years when dogs were killed in public spaces and the meat was cooked and eaten with the spirit of celebration. The festival officially kicks off on Summer Solstice, which falls on Wednesday this year. According to local customs and traditional Chinese medicine theory, dog meat is nutritious and helps to protect people from diseases that are common in summer. China's local governments usually enthusiastically promote their local festivals and customs to boost local GDP, but the government in Yulin has always treated the dog meat festival with caution and never officially promoted it despite its great potential to rake in money. The Chinese public, especially the urban middle class, have developed a similar outlook on animal rights as their Western counterparts, but the dog-eating tradition has continued. 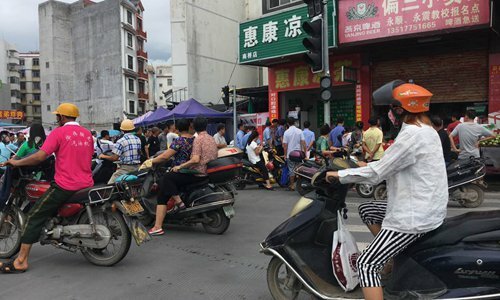 People from other cities in Guangxi or neighboring Guangdong Province have gathered in Yulin to taste the local delicacy. To many in China, eating dog meat is a nonissue and is not just limited to Yulin. "Eating dog meat is a long-standing tradition in Yulin, and to us, eating dog is just like eating fish and chicken. Have you seen chicken lovers trying to stop people from eating chicken? "said a local resident surnamed Liang. Such views are confronted, sometimes violently by animal rights activists from all over the country, who have also descended on the city trying to stop the event. They usually purchase dogs from vendors in order to save their lives, but some resort to force to stop dog meat eateries running their business. Local residents said that they felt irritated by militant animal activists. And on China's social media, netizens have also been debating heatedly over the festival and animal rights activism. While emotions are running high against eating dog meat, some question the motive of the activists or whether their method of rescuing dogs is feasible. For instance, the high-profile operation by Marc Ching, who was dubbed as "animal crusader" for his bid to rescue 1,000 dogs from the dinner table in Yulin, was found to end with hundreds of dogs suffering slow and excruciatingly painful deaths within days of being rescued, the Daily Mail reported in 2016. A volunteer from Hushengyuan, an animal protection organization, who is working in Yulin told the Global Times that they spent nearly 60,000 yuan on one day and rescued 300 to 400 dogs, and their funds mainly came from online donations. Animal rights activists also claim that many dogs to be eaten are stolen or are stray dogs, thus they haven't gone through quarantine. "In order to get more dogs, the dog thieves even poison dogs," said Yun Kong, an activist. But a dog seller in the Dongkou market in Yulin said that all the dog meat sold in the market was authorized by the local food safety watchdog, and that they only bought dogs that are raised for food, not pet dogs. Liu Lang, head of the Beijing Association of Small Animal Veterinary Medicine, explained in a report that breeding cats or dogs for meat would be impossible due to feed and vaccination costs.